They’re sensitive, so they need regular maintenance to prevent infections. Dogs don’t want their ears cleaned, so you’re going to have to work with them. If you don’t do it the right way, you can cause serious damage. 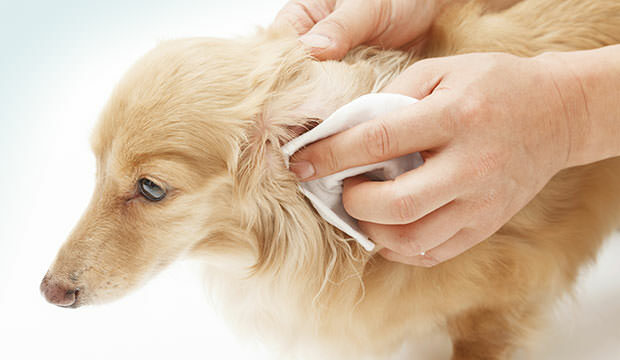 So how exactly do you go about cleaning your dog’s ears to keep him or her healthy? Never use Q-Tips to clean dog ears. Just like with human ears, Q-Tips tend to pack more junk down the ear canal then it does getting it out of there. Also, you should never use alcohol or hydrogen peroxide to clean dog ears as that can be irritating. At any point of the process, if your dog yelps in pain, stop immediately, as this could be the sign of an ear infection. Use lots of liquid to dissolve the debris and wax build up in your dog’s ears. One way to do this is to fill the ear up with the ear cleaning solution, until it overflows a bit. Rub it in by massaging under the lower part of the ear and the ear fold with your hand. This motion will make a squishy sound. Do this for about 30 seconds. After you massage, take a tissue and gently wipe out the ear gunk. Don’t expect too much gunk – you should see some brown debris (that’s the ear wax) on the tissue. If you get a lot of brown stuff coming out, repeat step 2. If you repeat and still get a lot of brown goop, just let it be for a day or two and try it again. That way, the cleaner has a chance to works its magic and soften up the wax so you’ll be able to get it all out. If you still keep getting a lot of brown stuff coming out of your dog’s ear, it may be a sign of an ear infection. Call your vet and have it checked out. If your dog isn’t a willing participant in the ear cleaning, use a cotton ball to clean out the goop. Soak it with the ear cleaning solution until it is dripping. Don’t use tissue for this, because when the tissue is saturated with the solution, it will fall apart in the ear and pieces may get left behind. Tuck the cotton ball into the dog’s ear (don’t pack it in) and massage the ear just like in step 2. You’ll get the same effect as you would with just the ear cleaning solution. Some dogs don’t like the feeling of solution running into its ear, and the cotton ball gets just as much gunk out. After 30 seconds of massage, take the cotton ball out of the ear. Take a dry tissue and wipe out any of that brown nasty stuff. Repeat this step if necessary. There will be residual ear cleaning solution left behind. You don’t have to worry about this or wash it off. It won’t do any harm. And if this is part of the entire grooming routine, you may want to start off with the ear cleaning, followed by a bath. It’ll be a complete dog spa day!